The magnificent island monastery of Mont Saint Michel is one of France’s most recognizable postcard images, and a private tour is the most convenient way to visit. This full-day tour from St Malo includes round-trip transport and a guided tour of the UNESCO-listed monuments, with plenty of time to admire the views and take photos. Your tour begins with pick-up from your St Malo hotel or St Malo cruise port by private vehicle. After kick starting the day with coffee and fresh croissants, set out on the drive to the Mont Saint Michel. Admire the views as you wind through the Brittany countryside and pass historic villages. Make a stop in Avranches to visit the Saint-Gervais Basilica and hear the fascinating legend of Bishop Aubert, whose skull was touched by the Archangel Michel in 708 AD, apparently instructing him to build a monastery on the Mont. His skull, encased in a lavish shrine, is now on display in the basilica. Learn more about the history of the monastery as you approach the coast and spot the fairy-tale spires of the Mont Saint Michel on the horizon. It’s undeniably picturesque, so be sure to snap plenty of photos as you admire the views out to the island. After crossing over to the island, enjoy lunch (own expense) at Mere Poulard, famous for its delicious omelets, or at one of the many other restaurants, before setting out to explore the monastery. Accompanied by your guide, stroll the narrow streets of the monastery complex, browse the many souvenir shops of the Grande Rue, and climb the Grande Staircase to the hilltop Abbey Church. The views from the top are magnificent, so don’t forget to bring your camera. After an afternoon enjoying the monastery, head back to St Malo, where your tour ends with drop-off at your hotel or cruise port. 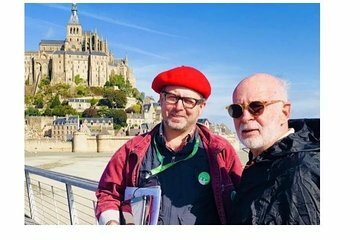 We had a full day private tour of Mont St. Michel with Igor Rosen. We were picked up at our hotel and driven on the coastal path toward Mont St. Michel, from which you can see from afar during the approach. Once we arrived, we walked the distance from the parking lot to the Abbey although transport is available. However, we were very happy we chose to walk and see the Abbey come fully into focus. During the drive, Igor gave us an overview of the history of the Abbey and initially took us to the site of the first small chapel built on the island. After a wonderful lunch of salt marsh lamb a must try in the village, we did an in depth tour of the Abbey and were very impressed with Igor's knowledge and his willingness to pace the tour to our desire. We would highly recommend this tour and Igor.